"WWW" and "The Web" redirect here. For other uses of WWW, see WWW (disambiguation). For other uses of web, see Web (disambiguation). For the first web software, see WorldWideWeb. Not to be confused with the Internet. A web page can be displayed using a web browser. Web browsers often highlight and underline hypertext links and web pages can contain images. The World Wide Web (WWW), commonly known as the Web, is an information space where documents and other web resources are identified by Uniform Resource Locators (URLs, such as https://www.example.com/), which may be interlinked by hypertext, and are accessible over the Internet. The resources of the WWW may be accessed by users by a software application called a web browser. English scientist Tim Berners-Lee invented the World Wide Web in 1989. He wrote the first web browser in 1990 while employed at CERN near Geneva, Switzerland. The browser was released outside CERN in 1991, first to other research institutions starting in January 1991 and then to the general public in August 1991. The World Wide Web has been central to the development of the Information Age and is the primary tool billions of people use to interact on the Internet. Web resources may be any type of downloaded media, but web pages are hypertext media that have been formatted in Hypertext Markup Language (HTML). Such formatting allows for embedded hyperlinks that contain URLs and permit users to navigate to other web resources. In addition to text, web pages may contain images, video, audio, and software components that are rendered in the user's web browser as coherent pages of multimedia content. Multiple web resources with a common theme, a common domain name, or both, make up a website. Websites are stored in computers that are running a program called a web server that responds to requests made over the Internet from web browsers running on a user's computer. Website content can be largely provided by a publisher, or interactively where users contribute content or the content depends upon the users or their actions. Websites may be provided for a myriad of informative, entertainment, commercial, governmental, or non-governmental reasons. The NeXT Computer used by Tim Berners-Lee at CERN. Tim Berners-Lee's vision of a global hyperlinked information system became a possibility by the second half of the 1980s. By 1985, the global Internet began to proliferate in Europe and the Domain Name System (upon which the Uniform Resource Locator is built) came into being. In 1988 the first direct IP connection between Europe and North America was made and Berners-Lee began to openly discuss the possibility of a web-like system at CERN. While working at CERN, Berners-Lee became frustrated with the inefficiencies and difficulties posed by finding information stored on different computers. On March 12, 1989, he submitted a memorandum, titled "Information Management: A Proposal", to the management at CERN for a system called "Mesh" that referenced ENQUIRE, a database and software project he had built in 1980, which used the term "web" and described a more elaborate information management system based on links embedded as text: "Imagine, then, the references in this document all being associated with the network address of the thing to which they referred, so that while reading this document, you could skip to them with a click of the mouse." Such a system, he explained, could be referred to using one of the existing meanings of the word hypertext, a term that he says was coined in the 1950s. There is no reason, the proposal continues, why such hypertext links could not encompass multimedia documents including graphics, speech and video, so that Berners-Lee goes on to use the term hypermedia. With help from his colleague and fellow hypertext enthusiast Robert Cailliau he published a more formal proposal on 12 November 1990 to build a "Hypertext project" called "WorldWideWeb" (one word) as a "web" of "hypertext documents" to be viewed by "browsers" using a client–server architecture. At this point HTML and HTTP had already been in development for about two months and the first Web server was about a month from completing its first successful test. This proposal estimated that a read-only web would be developed within three months and that it would take six months to achieve "the creation of new links and new material by readers, [so that] authorship becomes universal" as well as "the automatic notification of a reader when new material of interest to him/her has become available". While the read-only goal was met, accessible authorship of web content took longer to mature, with the wiki concept, WebDAV, blogs, Web 2.0 and RSS/Atom. The proposal was modelled after the SGML reader Dynatext by Electronic Book Technology, a spin-off from the Institute for Research in Information and Scholarship at Brown University. The Dynatext system, licensed by CERN, was a key player in the extension of SGML ISO 8879:1986 to Hypermedia within HyTime, but it was considered too expensive and had an inappropriate licensing policy for use in the general high energy physics community, namely a fee for each document and each document alteration. A NeXT Computer was used by Berners-Lee as the world's first web server and also to write the first web browser, WorldWideWeb, in 1990. By Christmas 1990, Berners-Lee had built all the tools necessary for a working Web: the first web browser (which was a web editor as well) and the first web server. The first web site, which described the project itself, was published on 20 December 1990. The first web page may be lost, but Paul Jones of UNC-Chapel Hill in North Carolina announced in May 2013 that Berners-Lee gave him what he says is the oldest known web page during a 1991 visit to UNC. Jones stored it on a magneto-optical drive and on his NeXT computer. On 6 August 1991, Berners-Lee published a short summary of the World Wide Web project on the newsgroup alt.hypertext. This date is sometimes confused with the public availability of the first web servers, which had occurred months earlier. As another example of such confusion, several news media reported that the first photo on the Web was published by Berners-Lee in 1992, an image of the CERN house band Les Horribles Cernettes taken by Silvano de Gennaro; Gennaro has disclaimed this story, writing that media were "totally distorting our words for the sake of cheap sensationalism". The first server outside Europe was installed at the Stanford Linear Accelerator Center (SLAC) in Palo Alto, California, to host the SPIRES-HEP database. Accounts differ substantially as to the date of this event. The World Wide Web Consortium's timeline says December 1992, whereas SLAC itself claims December 1991, as does a W3C document titled A Little History of the World Wide Web. The underlying concept of hypertext originated in previous projects from the 1960s, such as the Hypertext Editing System (HES) at Brown University, Ted Nelson's Project Xanadu, and Douglas Engelbart's oN-Line System (NLS). Both Nelson and Engelbart were in turn inspired by Vannevar Bush's microfilm-based memex, which was described in the 1945 essay "As We May Think". the Hypertext Transfer Protocol (HTTP). The World Wide Web had several differences from other hypertext systems available at the time. The Web required only unidirectional links rather than bidirectional ones, making it possible for someone to link to another resource without action by the owner of that resource. It also significantly reduced the difficulty of implementing web servers and browsers (in comparison to earlier systems), but in turn presented the chronic problem of link rot. Unlike predecessors such as HyperCard, the World Wide Web was non-proprietary, making it possible to develop servers and clients independently and to add extensions without licensing restrictions. On 30 April 1993, CERN announced that the World Wide Web would be free to anyone, with no fees due. Coming two months after the announcement that the server implementation of the Gopher protocol was no longer free to use, this produced a rapid shift away from Gopher and towards the Web. An early popular web browser was ViolaWWW for Unix and the X Window System. 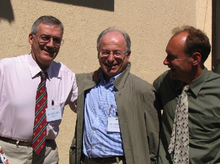 Robert Cailliau, Jean-François Abramatic, and Tim Berners-Lee at the 10th anniversary of the World Wide Web Consortium. Scholars generally agree that a turning point for the World Wide Web began with the introduction of the Mosaic web browser in 1993, a graphical browser developed by a team at the National Center for Supercomputing Applications at the University of Illinois at Urbana–Champaign (NCSA-UIUC), led by Marc Andreessen. Funding for Mosaic came from the US High-Performance Computing and Communications Initiative and the High Performance Computing Act of 1991, one of several computing developments initiated by US Senator Al Gore. Prior to the release of Mosaic, graphics were not commonly mixed with text in web pages and the web's popularity was less than that of older protocols in use over the Internet, such as Gopher and Wide Area Information Servers (WAIS). Mosaic's graphical user interface allowed the Web to become, by far, the most popular Internet protocol. The World Wide Web Consortium (W3C) was founded by Tim Berners-Lee after he left the European Organization for Nuclear Research (CERN) in October 1994. It was founded at the Massachusetts Institute of Technology Laboratory for Computer Science (MIT/LCS) with support from the Defense Advanced Research Projects Agency (DARPA), which had pioneered the Internet; a year later, a second site was founded at INRIA (a French national computer research lab) with support from the European Commission DG InfSo; and in 1996, a third continental site was created in Japan at Keio University. By the end of 1994, the total number of websites was still relatively small, but many notable websites were already active that foreshadowed or inspired today's most popular services. Connected by the Internet, other websites were created around the world. This motivated international standards development for protocols and formatting. Berners-Lee continued to stay involved in guiding the development of web standards, such as the markup languages to compose web pages and he advocated his vision of a Semantic Web. The World Wide Web enabled the spread of information over the Internet through an easy-to-use and flexible format. It thus played an important role in popularising use of the Internet. Although the two terms are sometimes conflated in popular use, World Wide Web is not synonymous with Internet. The Web is an information space containing hyperlinked documents and other resources, identified by their URIs. It is implemented as both client and server software using Internet protocols such as TCP/IP and HTTP. Berners-Lee was knighted in 2004 by Queen Elizabeth II for "services to the global development of the Internet". He never patented his invention. The World Wide Web functions as an application layer protocol that is run "on top of" (figuratively) the Internet, helping to make it more functional. The advent of the Mosaic web browser helped to make the web much more usable, to include the display of images and moving images (GIFs). The terms Internet and World Wide Web are often used without much distinction. However, the two terms do not mean the same thing. The Internet is a global system of interconnected computer networks. In contrast, the World Wide Web is a global collection of documents and other resources, linked by hyperlinks and URIs. Web resources are accessed using HTTP or HTTPS, which are application-level Internet protocols that use the Internet's transport protocols. Viewing a web page on the World Wide Web normally begins either by typing the URL of the page into a web browser, or by following a hyperlink to that page or resource. The web browser then initiates a series of background communication messages to fetch and display the requested page. In the 1990s, using a browser to view web pages—and to move from one web page to another through hyperlinks—came to be known as 'browsing,' 'web surfing' (after channel surfing), or 'navigating the Web'. Early studies of this new behaviour investigated user patterns in using web browsers. One study, for example, found five user patterns: exploratory surfing, window surfing, evolved surfing, bounded navigation and targeted navigation. The web browser parses the HTML and interprets the markup (<title>, <p> for paragraph, and such) that surrounds the words to format the text on the screen. Many web pages use HTML to reference the URLs of other resources such as images, other embedded media, scripts that affect page behaviour, and Cascading Style Sheets that affect page layout. The browser makes additional HTTP requests to the web server for these other Internet media types. As it receives their content from the web server, the browser progressively renders the page onto the screen as specified by its HTML and these additional resources. Web browsers receive HTML documents from a web server or from local storage and render the documents into multimedia web pages. HTML describes the structure of a web page semantically and originally included cues for the appearance of the document. HTML elements are the building blocks of HTML pages. With HTML constructs, images and other objects such as interactive forms may be embedded into the rendered page. HTML provides a means to create structured documents by denoting structural semantics for text such as headings, paragraphs, lists, links, quotes and other items. HTML elements are delineated by tags, written using angle brackets. Tags such as <img /> and <input /> directly introduce content into the page. Other tags such as <p> surround and provide information about document text and may include other tags as sub-elements. Browsers do not display the HTML tags, but use them to interpret the content of the page. 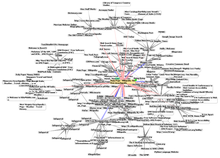 Such a collection of useful, related resources, interconnected via hypertext links is dubbed a web of information. Publication on the Internet created what Tim Berners-Lee first called the WorldWideWeb (in its original CamelCase, which was subsequently discarded) in November 1990. The hyperlink structure of the WWW is described by the webgraph: the nodes of the web graph correspond to the web pages (or URLs) the directed edges between them to the hyperlinks. Over time, many web resources pointed to by hyperlinks disappear, relocate, or are replaced with different content. This makes hyperlinks obsolete, a phenomenon referred to in some circles as link rot, and the hyperlinks affected by it are often called dead links. The ephemeral nature of the Web has prompted many efforts to archive web sites. The Internet Archive, active since 1996, is the best known of such efforts. Many hostnames used for the World Wide Web begin with www because of the long-standing practice of naming Internet hosts according to the services they provide. The hostname of a web server is often www, in the same way that it may be ftp for an FTP server, and news or nntp for a Usenet news server. These host names appear as Domain Name System (DNS) or subdomain names, as in www.example.com. The use of www is not required by any technical or policy standard and many web sites do not use it; the first web server was nxoc01.cern.ch. According to Paolo Palazzi, who worked at CERN along with Tim Berners-Lee, the popular use of www as subdomain was accidental; the World Wide Web project page was intended to be published at www.cern.ch while info.cern.ch was intended to be the CERN home page, however the DNS records were never switched, and the practice of prepending www to an institution's website domain name was subsequently copied. Many established websites still use the prefix, or they employ other subdomain names such as www2, secure or en for special purposes. Many such web servers are set up so that both the main domain name (e.g., example.com) and the www subdomain (e.g., www.example.com) refer to the same site; others require one form or the other, or they may map to different web sites. The use of a subdomain name is useful for load balancing incoming web traffic by creating a CNAME record that points to a cluster of web servers. Since, currently, only a subdomain can be used in a CNAME, the same result cannot be achieved by using the bare domain root. When a user submits an incomplete domain name to a web browser in its address bar input field, some web browsers automatically try adding the prefix "www" to the beginning of it and possibly ".com", ".org" and ".net" at the end, depending on what might be missing. For example, entering 'microsoft' may be transformed to http://www.microsoft.com/ and 'openoffice' to http://www.openoffice.org. This feature started appearing in early versions of Firefox, when it still had the working title 'Firebird' in early 2003, from an earlier practice in browsers such as Lynx. [unreliable source?] It is reported that Microsoft was granted a US patent for the same idea in 2008, but only for mobile devices. In English, www is usually read as double-u double-u double-u. Some users pronounce it dub-dub-dub, particularly in New Zealand. Stephen Fry, in his "Podgrams" series of podcasts, pronounces it wuh wuh wuh. The English writer Douglas Adams once quipped in The Independent on Sunday (1999): "The World Wide Web is the only thing I know of whose shortened form takes three times longer to say than what it's short for". In Mandarin Chinese, World Wide Web is commonly translated via a phono-semantic matching to wàn wéi wǎng (万维网), which satisfies www and literally means "myriad dimensional net",[better source needed] a translation that reflects the design concept and proliferation of the World Wide Web. Tim Berners-Lee's web-space states that World Wide Web is officially spelled as three separate words, each capitalised, with no intervening hyphens. Use of the www prefix has been declining, especially when Web 2.0 web applications sought to brand their domain names and make them easily pronounceable. As the mobile Web grew in popularity, services like Gmail.com, Outlook.com, Myspace.com, Facebook.com and Twitter.com are most often mentioned without adding "www." (or, indeed, ".com") to the domain. The scheme specifiers http:// and https:// at the start of a web URI refer to Hypertext Transfer Protocol or HTTP Secure, respectively. They specify the communication protocol to use for the request and response. The HTTP protocol is fundamental to the operation of the World Wide Web, and the added encryption layer in HTTPS is essential when browsers send or retrieve confidential data, such as passwords or banking information. Web browsers usually automatically prepend http:// to user-entered URIs, if omitted. A web page (also written as webpage) is a document that is suitable for the World Wide Web and web browsers. A web browser displays a web page on a monitor or mobile device. The term web page usually refers to what is visible, but may also refer to the contents of the computer file itself, which is usually a text file containing hypertext written in HTML or a comparable markup language. Typical web pages provide hypertext for browsing to other web pages via hyperlinks, often referred to as links. Web browsers will frequently have to access multiple web resource elements, such as reading style sheets, scripts, and images, while presenting each web page. On a network, a web browser can retrieve a web page from a remote web server. The web server may restrict access to a private network such as a corporate intranet. The web browser uses the Hypertext Transfer Protocol (HTTP) to make such requests to the web server. A static web page is delivered exactly as stored, as web content in the web server's file system. In contrast, a dynamic web page is generated by a web application, usually driven by server-side software. Dynamic web pages help the browser (the client) to enhance the web page through user input to the server. A static web page (sometimes called a flat page/stationary page) is a web page that is delivered to the user exactly as stored, in contrast to dynamic web pages which are generated by a web application. Consequently, a static web page displays the same information for all users, from all contexts, subject to modern capabilities of a web server to negotiate content-type or language of the document where such versions are available and the server is configured to do so. Dynamic web page: example of server-side scripting (PHP and MySQL). A server-side dynamic web page is a web page whose construction is controlled by an application server processing server-side scripts. In server-side scripting, parameters determine how the assembly of every new web page proceeds, including the setting up of more client-side processing. A dynamic web page is then reloaded by the user or by a computer program to change some variable content. The updating information could come from the server, or from changes made to that page's DOM. This may or may not truncate the browsing history or create a saved version to go back to, but a dynamic web page update using Ajax technologies will neither create a page to go back to, nor truncate the web browsing history forward of the displayed page. Using Ajax technologies the end user gets one dynamic page managed as a single page in the web browser while the actual web content rendered on that page can vary. The Ajax engine sits only on the browser requesting parts of its DOM, the DOM, for its client, from an application server. DHTML is the umbrella term for technologies and methods used to create web pages that are not static web pages, though it has fallen out of common use since the popularization of AJAX, a term which is now itself rarely used. Client-side-scripting, server-side scripting, or a combination of these make for the dynamic web experience in a browser. A website is a collection of related web resources including web pages, multimedia content, typically identified with a common domain name, and published on at least one web server. Notable examples are wikipedia.org, google.com, and amazon.com. A website may be accessible via a public Internet Protocol (IP) network, such as the Internet, or a private local area network (LAN), by referencing a uniform resource locator (URL) that identifies the site. Websites can have many functions and can be used in various fashions; a website can be a personal website, a corporate website for a company, a government website, an organization website, etc. Websites are typically dedicated to a particular topic or purpose, ranging from entertainment and social networking to providing news and education. All publicly accessible websites collectively constitute the World Wide Web, while private websites, such as a company's website for its employees, are typically a part of an intranet. A web browser (commonly referred to as a browser) is a software user agent for accessing information on the World Wide Web. To connect to a website's server and display its pages, a user needs to have a web browser program. This is the program that the user runs to download, format and display a web page on the user's computer. In addition to allowing users to find, displaying and moving between web pages, a web browser will usually have features like keeping bookmarks, recording history, managing cookies (see below) and home pages and may have facilities for recording passwords for logging into web sites. The most popular browsers are Chrome, Firefox, Safari, Internet Explorer, and Edge. A Web server is server software, or hardware dedicated to running said software, that can satisfy World Wide Web client requests. A web server can, in general, contain one or more websites. A web server processes incoming network requests over HTTP and several other related protocols. The primary function of a web server is to store, process and deliver web pages to clients. The communication between client and server takes place using the Hypertext Transfer Protocol (HTTP). Pages delivered are most frequently HTML documents, which may include images, style sheets and scripts in addition to the text content. 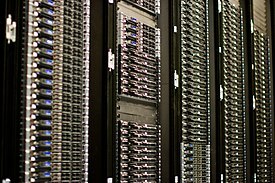 Multiple web servers may be used for a high traffic website; here, Dell servers are installed together being used for the Wikimedia Foundation. A user agent, commonly a web browser or web crawler, initiates communication by making a request for a specific resource using HTTP and the server responds with the content of that resource or an error message if unable to do so. The resource is typically a real file on the server's secondary storage, but this is not necessarily the case and depends on how the web server is implemented. While the primary function is to serve content, a full implementation of HTTP also includes ways of receiving content from clients. This feature is used for submitting web forms, including uploading of files. Many generic web servers also support server-side scripting using Active Server Pages (ASP), PHP (Hypertext Preprocessor), or other scripting languages. This means that the behaviour of the web server can be scripted in separate files, while the actual server software remains unchanged. Usually, this function is used to generate HTML documents dynamically ("on-the-fly") as opposed to returning static documents. The former is primarily used for retrieving or modifying information from databases. The latter is typically much faster and more easily cached but cannot deliver dynamic content. Web servers can also frequently be found embedded in devices such as printers, routers, webcams and serving only a local network. The web server may then be used as a part of a system for monitoring or administering the device in question. This usually means that no additional software has to be installed on the client computer since only a web browser is required (which now is included with most operating systems). Other kinds of cookies perform essential functions in the modern web. Perhaps most importantly, authentication cookies are the most common method used by web servers to know whether the user is logged in or not, and which account they are logged in with. Without such a mechanism, the site would not know whether to send a page containing sensitive information, or require the user to authenticate themselves by logging in. The security of an authentication cookie generally depends on the security of the issuing website and the user's web browser, and on whether the cookie data is encrypted. Security vulnerabilities may allow a cookie's data to be read by a hacker, used to gain access to user data, or used to gain access (with the user's credentials) to the website to which the cookie belongs (see cross-site scripting and cross-site request forgery for examples). The tracking cookies, and especially third-party tracking cookies, are commonly used as ways to compile long-term records of individuals' browsing histories – a potential privacy concern that prompted European and U.S. lawmakers to take action in 2011. European law requires that all websites targeting European Union member states gain "informed consent" from users before storing non-essential cookies on their device. Google Project Zero researcher Jann Horn describes ways cookies can be read by intermediaries, like Wi-Fi hotspot providers. He recommends to use the browser in incognito mode in such circumstances. A web search engine or Internet search engine is a software system that is designed to carry out web search (Internet search), which means to search the World Wide Web in a systematic way for particular information specified in a web search query. The search results are generally presented in a line of results, often referred to as search engine results pages (SERPs). The information may be a mix of web pages, images, videos, infographics, articles, research papers and other types of files. Some search engines also mine data available in databases or open directories. Unlike web directories, which are maintained only by human editors, search engines also maintain real-time information by running an algorithm on a web crawler. Internet content that is not capable of being searched by a web search engine is generally described as the deep web. The deep web, invisible web, or hidden web are parts of the World Wide Web whose contents are not indexed by standard web search engines. The opposite term to the deep web is the surface web, which is accessible to anyone using the Internet. Computer scientist Michael K. Bergman is credited with coining the term deep web in 2001 as a search indexing term. The content of the deep web is hidden behind HTTP forms, and includes many very common uses such as web mail, online banking, and services that users must pay for, and which is protected by a paywall, such as video on demand, some online magazines and newspapers, among others. The content of the deep web can be located and accessed by a direct URL or IP address, and may require a password or other security access past the public website page. Proposed solutions vary. Large security companies like McAfee already design governance and compliance suites to meet post-9/11 regulations, and some, like Finjan have recommended active real-time inspection of programming code and all content regardless of its source. Some have argued that for enterprises to see Web security as a business opportunity rather than a cost centre, while others call for "ubiquitous, always-on digital rights management" enforced in the infrastructure to replace the hundreds of companies that secure data and networks. Jonathan Zittrain has said users sharing responsibility for computing safety is far preferable to locking down the Internet. Every time a client requests a web page, the server can identify the request's IP address and usually logs it. Also, unless set not to do so, most web browsers record requested web pages in a viewable history feature, and usually cache much of the content locally. Unless the server-browser communication uses HTTPS encryption, web requests and responses travel in plain text across the Internet and can be viewed, recorded, and cached by intermediate systems. When a web page asks for, and the user supplies, personally identifiable information—such as their real name, address, e-mail address, etc.—web-based entities can associate current web traffic with that individual. If the website uses HTTP cookies, username and password authentication, or other tracking techniques, it can relate other web visits, before and after, to the identifiable information provided. In this way it is possible for a web-based organisation to develop and build a profile of the individual people who use its site or sites. It may be able to build a record for an individual that includes information about their leisure activities, their shopping interests, their profession, and other aspects of their demographic profile. These profiles are obviously of potential interest to marketeers, advertisers and others. Depending on the website's terms and conditions and the local laws that apply information from these profiles may be sold, shared, or passed to other organisations without the user being informed. For many ordinary people, this means little more than some unexpected e-mails in their in-box or some uncannily relevant advertising on a future web page. For others, it can mean that time spent indulging an unusual interest can result in a deluge of further targeted marketing that may be unwelcome. Law enforcement, counter terrorism, and espionage agencies can also identify, target and track individuals based on their interests or proclivities on the Web. Social networking sites try to get users to use their real names, interests, and locations, rather than pseudonyms, as their executives believe that this makes the social networking experience more engaging for users. On the other hand, uploaded photographs or unguarded statements can be identified to an individual, who may regret this exposure. Employers, schools, parents, and other relatives may be influenced by aspects of social networking profiles, such as text posts or digital photos, that the posting individual did not intend for these audiences. On-line bullies may make use of personal information to harass or stalk users. Modern social networking websites allow fine grained control of the privacy settings for each individual posting, but these can be complex and not easy to find or use, especially for beginners. Photographs and videos posted onto websites have caused particular problems, as they can add a person's face to an on-line profile. With modern and potential facial recognition technology, it may then be possible to relate that face with other, previously anonymous, images, events and scenarios that have been imaged elsewhere. Due to image caching, mirroring and copying, it is difficult to remove an image from the World Wide Web. Web standards include many interdependent standards and specifications, some of which govern aspects of the Internet, not just the World Wide Web. Even when not web-focused, such standards directly or indirectly affect the development and administration of web sites and web services. Considerations include the interoperability, accessibility and usability of web pages and web sites. Web standards are not fixed sets of rules, but are a constantly evolving set of finalized technical specifications of web technologies. Web standards are developed by standards organizations—groups of interested and often competing parties chartered with the task of standardization—not technologies developed and declared to be a standard by a single individual or company. It is crucial to distinguish those specifications that are under development from the ones that already reached the final development status (in case of W3C specifications, the highest maturity level). There are methods for accessing the Web in alternative mediums and formats to facilitate use by individuals with disabilities. These disabilities may be visual, auditory, physical, speech-related, cognitive, neurological, or some combination. Accessibility features also help people with temporary disabilities, like a broken arm, or ageing users as their abilities change. The Web receives information as well as providing information and interacting with society. The World Wide Web Consortium claims that it is essential that the Web be accessible, so it can provide equal access and equal opportunity to people with disabilities. Tim Berners-Lee once noted, "The power of the Web is in its universality. Access by everyone regardless of disability is an essential aspect." Many countries regulate web accessibility as a requirement for websites. International co-operation in the W3C Web Accessibility Initiative led to simple guidelines that web content authors as well as software developers can use to make the Web accessible to persons who may or may not be using assistive technology. The W3C Internationalisation Activity assures that web technology works in all languages, scripts, and cultures. Beginning in 2004 or 2005, Unicode gained ground and eventually in December 2007 surpassed both ASCII and Western European as the Web's most frequently used character encoding. Originally RFC 3986 allowed resources to be identified by URI in a subset of US-ASCII. RFC 3987 allows more characters—any character in the Universal Character Set—and now a resource can be identified by IRI in any language. ^ "What is the difference between the Web and the Internet?". W3C Help and FAQ. W3C. 2009. Archived from the original on 9 July 2015. Retrieved 16 July 2015. ^ McPherson, Stephanie Sammartino (2009). Tim Berners-Lee: Inventor of the World Wide Web. Twenty-First Century Books. ISBN 978-0-8225-7273-2. Archived from the original on 15 April 2016. ^ "World Wide Web Timeline". Pew Research Center. 11 March 2014. Archived from the original on 29 July 2015. Retrieved 1 August 2015. ^ Dewey, Caitlin (12 March 2014). "36 Ways the Web Has Changed Us". The Washington Post. Archived from the original on 9 September 2015. Retrieved 1 August 2015. ^ "Internet Live Stats". Archived from the original on 2 July 2015. Retrieved 1 August 2015. ^ Joseph Adamski; Kathy Finnegan (2007). New Perspectives on Microsoft Office Access 2007, Comprehensive. Cengage Learning. p. 390. ISBN 978-1-4239-0589-9. ^ Enzer, Larry (31 August 2018). "The Evolution of the World Wide Web". Monmouth Web Developers. Retrieved 31 August 2018. ^ May, Ashley (12 March 2019). "Happy 30th birthday, World Wide Web. Inventor outlines plan to combat hacking, hate speech". USA Today. Retrieved 12 March 2019. ^ Aja Romano (12 March 2019). "The World Wide Web – not the Internet – turns 30 years old". Vox.com. ^ Berners-Lee, Tim (March 1989). "Information Management: A Proposal". W3C. Archived from the original on 15 March 2009. Retrieved 27 July 2009. ^ a b Berners-Lee, Tim; Cailliau, Robert (12 November 1990). "WorldWideWeb: Proposal for a HyperText Project". Archived from the original on 2 May 2015. Retrieved 12 May 2015. ^ "Tim Berners-Lee's original World Wide Web browser". Archived from the original on 17 July 2011. With recent phenomena like blogs and wikis, the Web is beginning to develop the kind of collaborative nature that its inventor envisaged from the start. ^ "Tim Berners-Lee: client". W3.org. Archived from the original on 21 July 2009. Retrieved 27 July 2009. ^ "First Web pages". W3.org. Archived from the original on 31 January 2010. Retrieved 27 July 2009. ^ "The birth of the web". CERN. Archived from the original on 24 December 2015. Retrieved 23 December 2015. ^ Murawski, John (24 May 2013). "Hunt for world's oldest WWW page leads to UNC Chapel Hill". News & Observer. Archived from the original on 8 June 2013. ^ "Short summary of the World Wide Web project". 6 August 1991. Retrieved 27 July 2009. ^ "Silvano de Gennaro disclaims 'the first photo on the Web'". Archived from the original on 4 August 2012. Retrieved 27 July 2012. If you read well our website, it says that it was, to our knowledge, the 'first photo of a band'. Dozens of media are totally distorting our words for the sake of cheap sensationalism. Nobody knows which was the first photo on the Web. ^ "W3C timeline". Archived from the original on 31 March 2010. Retrieved 30 March 2010. ^ "The Early World Wide Web at SLAC". Archived from the original on 24 November 2005. ^ "About SPIRES". 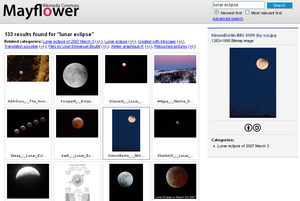 Archived from the original on 12 February 2010. Retrieved 30 March 2010. 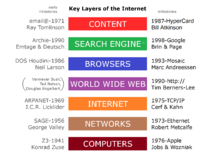 ^ "A Little History of the World Wide Web". Archived from the original on 6 May 2013. ^ "Inventor of the Week Archive: The World Wide Web". Massachusetts Institute of Technology: MIT School of Engineering. Archived from the original on 8 June 2010. Retrieved 23 July 2009. ^ "Ten Years Public Domain for the Original Web Software". Tenyears-www.web.cern.ch. 30 April 2003. Archived from the original on 13 August 2009. Retrieved 27 July 2009. ^ "Mosaic Web Browser History – NCSA, Marc Andreessen, Eric Bina". Livinginternet.com. Retrieved 27 July 2009. ^ "NCSA Mosaic – September 10, 1993 Demo". Totic.org. Retrieved 27 July 2009. ^ "Vice President Al Gore's ENIAC Anniversary Speech". Cs.washington.edu. 14 February 1996. Archived from the original on 20 February 2009. Retrieved 27 July 2009. ^ "Internet legal definition of Internet". West's Encyclopedia of American Law, edition 2. Free Online Law Dictionary. 15 July 2009. Retrieved 25 November 2008. ^ "WWW (World Wide Web) Definition". TechTerms. Archived from the original on 11 May 2009. Retrieved 19 February 2010. ^ Jacobs, Ian; Walsh, Norman (15 December 2004). "Architecture of the World Wide Web, Volume One". Introduction: W3C. Archived from the original on 9 February 2015. Retrieved 11 February 2015. ^ "Supplement no.1, Diplomatic and Overseas List, K.B.E." (PDF). thegazette.co.uk. The Gazette. 31 December 2003. Archived (PDF) from the original on 3 February 2016. Retrieved 7 February 2016. ^ "Web's inventor gets a knighthood". BBC. 31 December 2003. Archived from the original on 23 December 2007. Retrieved 25 May 2008. ^ "What is the difference between the Web and the Internet?". World Wide Web Consortium. Archived from the original on 22 April 2016. Retrieved 18 April 2016. ^ Muylle, Steve; Rudy Moenaert; Marc Despont (1999). "A grounded theory of World Wide Web search behaviour". Journal of Marketing Communications. 5 (3): 143. doi:10.1080/135272699345644. Archived from the original on 20 October 2014. ^ "HTML 4.0 Specification – W3C Recommendation – Conformance: requirements and recommendations". World Wide Web Consortium. 18 December 1997. Retrieved 6 July 2015. ^ Berners-Lee, Tim. "Frequently asked questions by the Press". W3C. Archived from the original on 2 August 2009. Retrieved 27 July 2009. ^ Dominic Fraser (13 May 2018). "Why a domain's root can't be a CNAME – and other tidbits about the DNS". FreeCodeCamp. ^ "automatically adding www.___.com". mozillaZine. 16 May 2003. Archived from the original on 27 June 2009. Retrieved 27 May 2009. ^ Masnick, Mike (7 July 2008). "Microsoft Patents Adding 'www.' And '.com' To Text". Techdirt. Archived from the original on 27 June 2009. Retrieved 27 May 2009. ^ "Audible pronunciation of 'WWW'". Oxford University Press. Archived from the original on 25 May 2014. Retrieved 25 May 2014. ^ "Stephen Fry's pronunciation of 'WWW'". Podcasts.com. Archived from the original on 4 April 2017. ^ Simonite, Tom (22 July 2008). "Help us find a better way to pronounce www". newscientist.com. New Scientist, Technology. Archived from the original on 13 March 2016. Retrieved 7 February 2016. ^ "MDBG Chinese-English dictionary – Translate". Archived from the original on 12 November 2008. Retrieved 27 July 2009. ^ "Frequently asked questions by the Press – Tim BL". W3.org. Archived from the original on 2 August 2009. Retrieved 27 July 2009. ^ Castelluccio, Michael (2010). "It's not your grandfather's Internet". thefreelibrary.com. Institute of Management Accountants. Retrieved 7 February 2016. ^ Buntin, Seth (23 September 2008). "jQuery Polling plugin". Archived from the original on 13 August 2009. Retrieved 22 August 2009. ^ "website". TheFreeDictionary.com. Retrieved 2 July 2011. ^ "Difference Between Search Engine and Browser". ^ "What is web server?'". webdevelopersnotes. 23 November 2010. Retrieved 1 February 2019. ^ Patrick, Killelea (2002). Web performance tuning (2nd ed.). Beijing: O'Reilly. p. 264. ISBN 978-0596001728. OCLC 49502686. ^ Vamosi, Robert (14 April 2008). "Gmail cookie stolen via Google Spreadsheets". News.cnet.com. Retrieved 19 October 2017. ^ "What about the "EU Cookie Directive"?". WebCookies.org. 2013. Retrieved 19 October 2017. ^ "New net rules set to make cookies crumble". BBC. 8 March 2011. ^ "Sen. Rockefeller: Get Ready for a Real Do-Not-Track Bill for Online Advertising". Adage.com. 6 May 2011. ^ Want to use my wifi?, Jann Horn, accessed 2018-01-05. ^ Hamilton, Nigel. "The Mechanics of a Deep Net Metasearch Engine". CiteSeerX 10.1.1.90.5847. ^ Devine, Jane; Egger-Sider, Francine (July 2004). "Beyond google: the invisible web in the academic library". The Journal of Academic Librarianship. 30 (4): 265–269. doi:10.1016/j.acalib.2004.04.010. ^ Raghavan, Sriram; Garcia-Molina, Hector (11–14 September 2001). "Crawling the Hidden Web". 27th International Conference on Very Large Data Bases. ^ "Surface Web". Computer Hope. Retrieved 20 June 2018. ^ Wright, Alex (22 February 2009). "Exploring a 'Deep Web' That Google Can't Grasp". The New York Times. Retrieved 23 February 2009. ^ Madhavan, J., Ko, D., Kot, Ł., Ganapathy, V., Rasmussen, A., & Halevy, A. (2008). Google's deep web crawl. Proceedings of the VLDB Endowment, 1(2), 1241–52. ^ a b Ben-Itzhak, Yuval (18 April 2008). "Infosecurity 2008 – New defence strategy in battle against e-crime". ComputerWeekly. Reed Business Information. Archived from the original on 4 June 2008. Retrieved 20 April 2008. ^ Christey, Steve & Martin, Robert A. (22 May 2007). "Vulnerability Type Distributions in CVE (version 1.1)". MITRE Corporation. Archived from the original on 15 April 2013. Retrieved 7 June 2008. ^ "Symantec Internet Security Threat Report: Trends for July–December 2007 (Executive Summary)" (PDF). XIII. Symantec Corp. April 2008: 1–2. Archived (PDF) from the original on 25 June 2008. Retrieved 11 May 2008. ^ "Google searches web's dark side". BBC News. 11 May 2007. Archived from the original on 7 March 2008. Retrieved 26 April 2008. ^ "Security Threat Report (Q1 2008)" (PDF). Sophos. Archived (PDF) from the original on 15 April 2013. Retrieved 24 April 2008. ^ "Security threat report" (PDF). Sophos. July 2008. Archived (PDF) from the original on 15 April 2013. Retrieved 24 August 2008. ^ O'Reilly, Tim (30 September 2005). "What Is Web 2.0". O'Reilly Media. pp. 4–5. Archived from the original on 15 April 2013. Retrieved 4 June 2008. and AJAX web applications can introduce security vulnerabilities like "client-side security controls, increased attack surfaces, and new possibilities for Cross-Site Scripting (XSS)", in Ritchie, Paul (March 2007). "The security risks of AJAX/web 2.0 applications" (PDF). Infosecurity. Archived from the original (PDF) on 25 June 2008. Retrieved 6 June 2008. which cites Hayre, Jaswinder S. & Kelath, Jayasankar (22 June 2006). "Ajax Security Basics". SecurityFocus. Archived from the original on 15 May 2008. Retrieved 6 June 2008. ^ Berinato, Scott (1 January 2007). "Software Vulnerability Disclosure: The Chilling Effect". CSO. CXO Media. p. 7. Archived from the original on 18 April 2008. Retrieved 7 June 2008. ^ "2012 Global Losses From phishing Estimated At $1.5 Bn". FirstPost. 20 February 2013. Archived from the original on 21 December 2014. Retrieved 25 January 2019. ^ Prince, Brian (9 April 2008). "McAfee Governance, Risk and Compliance Business Unit". eWEEK. Ziff Davis Enterprise Holdings. Retrieved 25 April 2008. ^ Preston, Rob (12 April 2008). "Down To Business: It's Past Time To Elevate The Infosec Conversation". InformationWeek. United Business Media. Archived from the original on 14 April 2008. Retrieved 25 April 2008. ^ Claburn, Thomas (6 February 2007). "RSA's Coviello Predicts Security Consolidation". InformationWeek. United Business Media. Archived from the original on 7 February 2009. Retrieved 25 April 2008. ^ Duffy Marsan, Carolyn (9 April 2008). "How the iPhone is killing the 'Net". Network World. IDG. Archived from the original on 14 April 2008. Retrieved 17 April 2008. ^ boyd, danah; Hargittai, Eszter (July 2010). "Facebook privacy settings: Who cares?". First Monday. 15 (8). doi:10.5210/fm.v15i8.3086. ^ "W3C Technical Reports and Publications". W3C. Retrieved 19 January 2009. ^ "IETF RFC page". IETF. Retrieved 19 January 2009. ^ "Search for World Wide Web in ISO standards". ISO. Retrieved 19 January 2009. ^ "Ecma formal publications". Ecma. Retrieved 19 January 2009. ^ "Unicode Technical Reports". Unicode Consortium. Retrieved 19 January 2009. ^ "IANA home page". IANA. Retrieved 19 January 2009. ^ Leslie Sikos (2011). Web standards – Mastering HTML5, CSS3, and XML. Apress. ISBN 978-1-4302-4041-9. ^ a b c "Web Accessibility Initiative (WAI)". World Wide Web Consortium. Archived from the original on 2 April 2009. Retrieved 7 April 2009. ^ "Developing a Web Accessibility Business Case for Your Organization: Overview". World Wide Web Consortium. Archived from the original on 14 April 2009. Retrieved 7 April 2009. ^ "Legal and Policy Factors in Developing a Web Accessibility Business Case for Your Organization". World Wide Web Consortium. Archived from the original on 5 April 2009. Retrieved 7 April 2009. ^ "Web Content Accessibility Guidelines (WCAG) Overview". World Wide Web Consortium. Archived from the original on 1 April 2009. Retrieved 7 April 2009. ^ "Internationalization (I18n) Activity". World Wide Web Consortium. Archived from the original on 16 April 2009. Retrieved 10 April 2009. ^ Davis, Mark (5 April 2008). "Moving to Unicode 5.1". Google. Archived from the original on 21 May 2009. Retrieved 10 April 2009. ^ "World Wide Web Consortium Supports the IETF URI Standard and IRI Proposed Standard" (Press release). World Wide Web Consortium. 26 January 2005. Archived from the original on 7 February 2009. Retrieved 10 April 2009. Berners-Lee, Tim; Bray, Tim; Connolly, Dan; Cotton, Paul; Fielding, Roy; Jeckle, Mario; Lilley, Chris; Mendelsohn, Noah; Orchard, David; Walsh, Norman; Williams, Stuart (15 December 2004). "Architecture of the World Wide Web, Volume One". Version 20041215. W3C. Berners-Lee, Tim (August 1996). "The World Wide Web: Past, Present and Future". Fielding, R.; Gettys, J.; Mogul, J.; Frystyk, H.; Masinter, L.; Leach, P.; Berners-Lee, T. (June 1999). "Hypertext Transfer Protocol – HTTP/1.1". Request For Comments 2616. Information Sciences Institute. Niels Brügger, ed. Web History (2010) 362 pages; Historical perspective on the World Wide Web, including issues of culture, content, and preservation. Polo, Luciano (2003). "World Wide Web Technology Architecture: A Conceptual Analysis". New Devices. 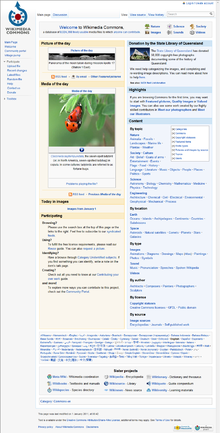 Wikimedia Commons has media related to World Wide Web. W3C Recommendations Reduce "World Wide Wait"